Non Woven Fabric Price: What influences it? Customers always want to know a Lowest price of the non-woven products from China, but they received huge different prices from the suppliers. For this blog, we will talk about the non woven fabric and finished products price, we will show you all the costs so that you can know the approximate costs, to avoid to buy a big price or a low price but with low quality. The main fiber for non woven fabric is PP (62%), polyester (24%) and viscose(6%). 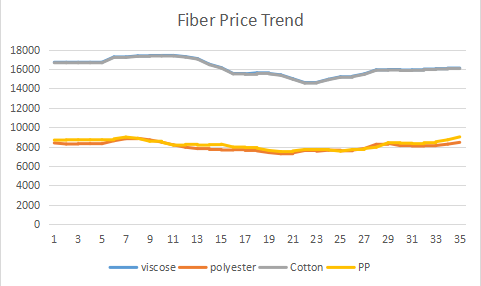 Both PP and Polyester is very close to petrol price, and viscose price is more relative to cotton price. Interesting in getting to know this price and trend? subscribe our blog or add our website as favorite, we will update it every month. This is the most important factor for the costs of the non woven fabric and products. The fiber is the main factor to settle the non woven fabric price. It makes that the chemical bonded fabric is more expensive than spunlace and needle punched fabric. For the spunbond non woven fabric, the processing costs is usually about 2500 rmb/ton. The exchange rate must be also considered, even sometimes the exchange rate changed too much, not only consider the USD:RMB, but also consider your local currency: USD. Check X-rate to see your exchange rate before your importing. Do you want to get an update for your non woven fabric from the professional non woven fabric manufacturer in China? Contact us and you will get a quotation within 24 hours.